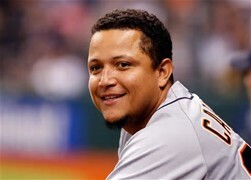 Miguel Cabrera made his major league debut at age 20 in 2003 with the Florida Marlins by hitting a walk-off home run, at that time the third player in MLB history to hit a game-winning HR in his big league debut. Since then Cabrera has been a nine-time All-Star, two-time league MVP and a triple Crown winner. Recently, Cabrera, who now plays for Detroit, hit his 400th HR and collected his 1,400th RBI within five days of each other. Following are a few stats you may not know about Cabrera. 1. Cabrera on May 16th became the 53rd player in MLB history to reach 400 home runs. Of the 53 players with 400-plus HRs, Cabrera has the sixth highest career batting average (.320), the ninth highest slugging percentage (.565) and the 12th highest OPS (.962). 2. Cabrera became the 28th right-handed hitter to reach the 400-HR mark. Of the 53 players with 400 career HRs, 25 are already in the Baseball Hall of Fame. 3. Cabrera became the 45th player in baseball history to reach 400 HRs and 1,400 RBI. He was the 70th player to collect 1,400 career RBIs. 4. Since his debut in 2003, Cabrera’s 400 HRs ranks fourth behind Albert Pujols (457), Adam Dunn (417) and David Ortiz (414). His 1,400 RBIs are the most of any player in baseball since ’03. Of players with at least 5,000 at-bats since 2003, Cabrera’s .320 career batting average is first on the list. 5. Cabrera has played for two teams in his 13-year career, five seasons with the Marlins and eight with the Tigers. He ranks fifth on the Marlins all-time list in home runs with 138 and third on the RBI totals with 523. His .313 career batting average in a Marlins uniform is the best in the franchise’s history. He is fourth on Detroit career HR list with 262 four-baggers, 13th on the list with 877 RBI, and sixth in the team’s history with a .326 average.